This laser tag gun differs from the previous version with RIS-mounting, which allows to “upgrade” the gun with various additional devices. 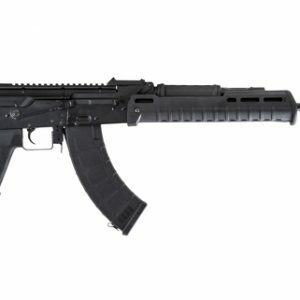 AKS 74U Hawk is made from CYMA airsoft body which recently has made a significant leap in the quality of its products. The body is all-metal and combines the features of airsoft and deactivated guns, it has folding buttstock and side bar for mounting the sight. Switching on of this laser tag gun is made with an anti-vandal mechanism that is located on the magazine. Recharging id made with the button. The power source of AKS 74U Hawk is a lithium battery with a capacity 3 Ah capacity. It means that you have guaranteed at least 30 hours of play without recharging. The weight of this model is 6 lb (2.7 kg); The length is 34 in (86 centimeters) with not folded buttstock and 24.5 in (62 centimeters) with folded buttstock. This laser tag gun will be an excellent addition to the arsenal of any rental business. For a long time, there was only one AKS-74U in the LASERWAR arsenal. Now we have three gaming kits based on this gun (please look at AKS-74U Raven and AKS 74U Falcon). All of them are great for rental, both for adult players and for children.